Shanghai Party Secretary Li Qiang headed a delegation of the Communist Party of China to visit Peru from July 19 to 22. During his visit, Li met Peru’s Prime Minister Cesar Villanueva; Gilbert Violeta, president of Peruvians for Change; and Luis Castaneda Lossio, mayor of Lima. While meeting Violeta, Li said at the invitation of Peruvians for Change, this visit can help increase political mutual trust and exchange ideas on issues concerning China and Peru, and to promote the Sino-Peru relations. The CPC is the largest party in the world and the largest governing party in a developing country with the largest population, and it has 69 years of experience in managing the country. Ever since the 18th National Congress of the CPC, the CPC Central Committee has been strengthening the building and the disciplining of the leadership of the CPC to align the party’s goals with the people’s needs. The CPC is willing to share its experience with Peru, focus on the common concerns, and increase the top leadership exchanges in China and Peru, and to promote the practical cooperation and the sustainable development of the Sino-Peru Strategic Partnership, Li added. Violeta said Peruvians for Change is dedicated to promotion of the social and economic development in Peru. It is also willing to foster the friendly cooperation with China and increase the understanding of people in both countries. The Peruvians for Change hopes to further deepen the inter-party communications with the CPC and learn from its experience in managing the country, and to promote the strategic partnership with China to benefit the people in both countries, Violeta added. 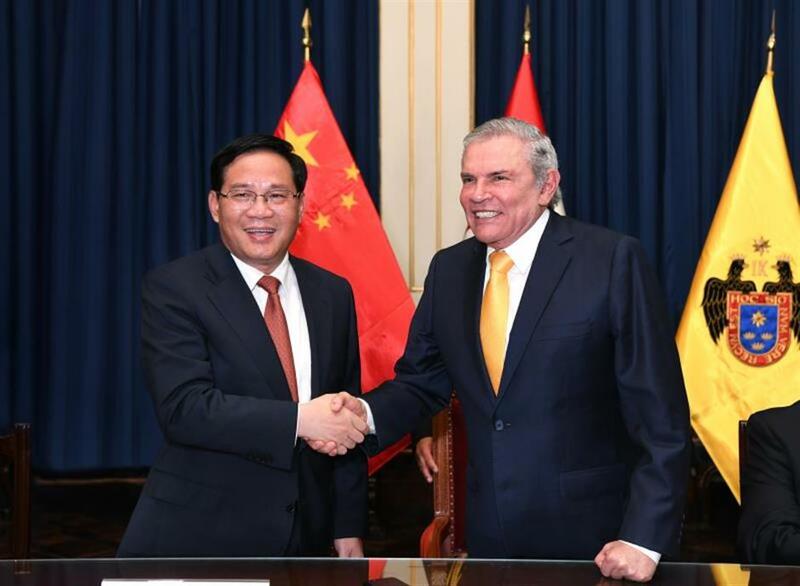 At a subsequent meeting with Mayor Castaneda, Li said both Shanghai and Lima are economic center cities, and the two have carried out cooperation in many forms in the industries such as trade, urban development, health and hygiene, and talent cultivation. Shanghai is working hard to accelerate the process of turning itself into an international economic, finance, trade, shipping center and also a technology and innovation center. At the same time, it is trying to build itself into an excellent and influential metropolis and a socialist modern city. The city is also striving to grant its citizens a sense of gain, happiness and security. Shanghai is willing to explore new management mechanisms that fit a metropolis such as Shanghai, and it also wants to cooperate with other big cities in the world and learn from their experience. Shanghai hopes to take the opportunity to further expand the existing exchanges with Lima and promote the practical cooperation in both cities, Li added. Castaneda said as an international modern city, Shanghai has its advantages in social and economic development, especially in urban management, which Lima can learn a great deal from. As the two cities have formed the twin city tie, Lima hopes it can deepen the cooperation with Shanghai in trade, cultural industries, tourism, and urban construction and management, Castaneda added. After the meeting, Li and Castaneda attended the signing ceremony of a friendly agreement between Shanghai and Lima. According to the agreement, the two cities will carry out cooperation and exchanges in various forms in urban planning, construction and management, trade, technology, cultural industries, education, sports, health and hygiene, and talent cultivation. Shanghai Municipal Government donated five new energy vehicles, produced by SAIC Motor Corporation, to the city governments of Lima and Cuzco to encourage the green urban development. Later, Li visited the Port of Callao and inspected Shanghai Zhenhua Heavy Industries Company’s installments such as travelling cranes and mobile cranes at the port. Li was briefed on the company’s global strategic layout and its business operations in Latin America. Li said to further expand into the overseas markets, the company needs to take the Latin America’s markets as a strong foothold, and work hard to become a model for the “Shanghai Manufacturing” brand and other Chinese companies. The company should stick to independent innovation and focus on the improvement of its manufacturing ability and services, and its intelligent equipment. During the tour, Li also visited the picture exhibition of Shanghai’s 40-year achievements of opening-up and reforms with Peru’s political officials. Jia Guide, China’s ambassador to Peru; Li Jun, deputy minister of International Department of the CPC Central Committee; and Zhou Bo, executive vice mayor of Peru, also attended the related events. Shanghai Party Secretary Li Qiang meets Gilbert Violeta, president of Peruvians for Change. 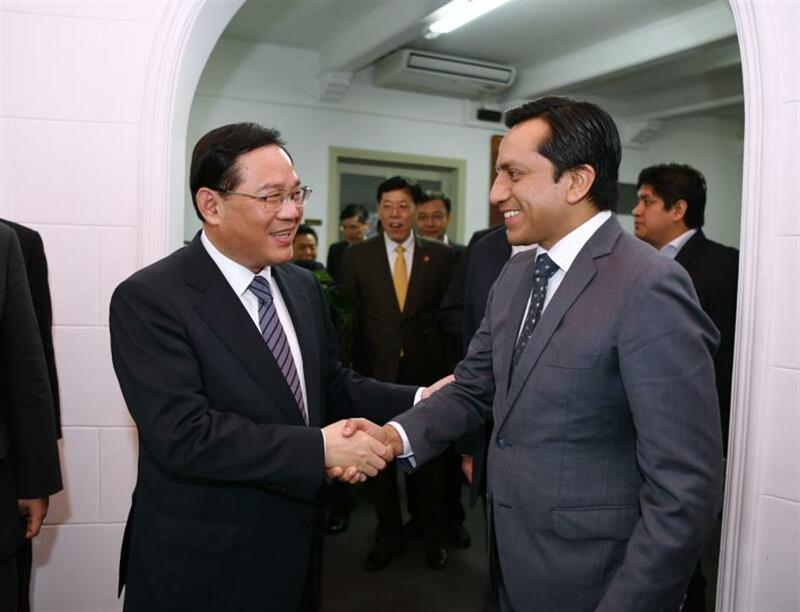 Shanghai Party Secretary Li Qiang meets Luis Castaneda Lossio, mayor of Lima.